Congressman Mike Bost and St. Clair County State's Attorney Brendan Kelly are engaged in one of the most competitive congressional race in America. Democrats see the 12th District as a building block to get back into the majority, which is why the party is investing lots of money toward defeating Bost. But unlike some other areas of Illinois, the 12th District hasn’t necessarily soured on President Donald Trump. In fact, his trade policies are popular in some parts of the district such as Granite City, where tariffs on imported steel are credited with reopening local mill jobs. St. Louis Public Radio's Jason Rosenbaum has more on the Illinois 12th Congressional District race. As the Bost-Kelly contest takes a combative tone of the airwaves, there may be things other than the national environment that decide the outcome. That includes Green Party candidate Randy Auxier, who will likely receive a solid slice of the vote — which will likely help Bost. The high national stakes and the unpredictable factors that may determine the outcome is one of the reasons national prognosticators are watching Illinois’ 12th District race closely. U.S. Rep. Mike Bost, R-Murphysboro, prepares for his guest appearance on St. Louis on the Air in 2014. Bost isn’t exactly a stranger to tough elections. The Murphysboro native and Marine Corps veteran started running for office in the 1980s, a time when Republicans weren’t exactly popular in parts of southern Illinois. When he ran for state representative in the 1990s, he literally put his foot in front doors when he was campaigning. Ultimately, Bost won election to the Illinois House in 1994. He served there for about 20 years, spending the majority of his time in Springfield as part of the minority. After serving in House leadership, Bost decided to challenge incumbent Congressman Bill Enyart in 2014 — a race that he ended up winning by more than 10 percentage points. Since entering the U.S. House, Bost has spent all of his time in the majority. And he said that’s provided him the opportunity to make an impact on agricultural, transportation and veterans policies. Bost touts legislation that passed the House, overhauling how human resources officials at the Department of Veterans Affairs are hired. He also pushed through legislation that would provide a cost-of-living increase for wartime disability compensation. If he’s re-elected and Republicans hold control of the House, Bost said he wants to make some of the 2017 tax cuts permanent. He also wants Republicans to overhaul parts of the Affordable Care Act — a policy goal that’s proven to be elusive since Trump became president. One thing he supports is creating pools for specific industries aimed at making it easier for employees to receive insurance. 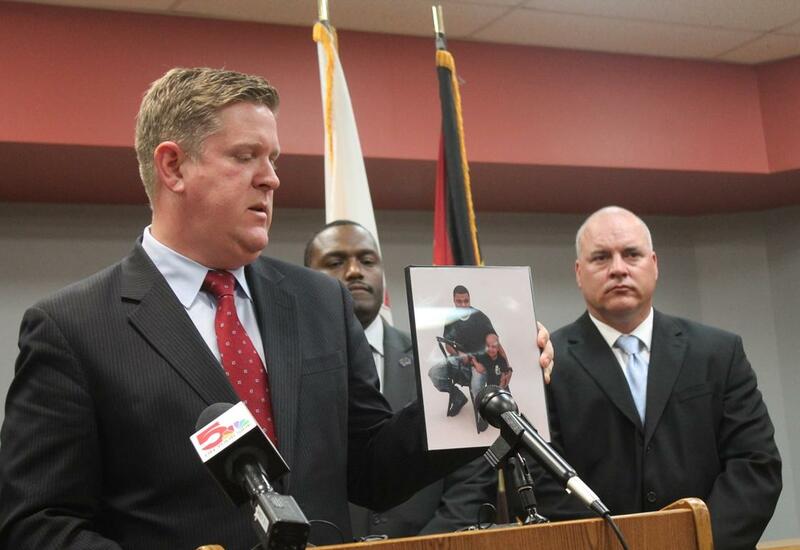 St. Clair County state's attorney Brendan Kelly holds a photo of Quiantez Fair, who was killed in East St. Louis. Kelly has served as the chief prosecutor in St. Clair County since 2010. While Kelly hasn’t been in public office as long as Bost, he’s been a fairly high-profile political figure in the St. Louis area for some time. Kelly, who served in the Navy and received his law degree from Saint Louis University, became St. Clair County state’s attorney in 2010. That’s given him a public platform in one of the 12th District’s largest counties. Some Democrats suggested that he run for Congress before 2016, but Kelly demurred — citing family commitments. He decided to take the plunge this year after expressing dismay about the state of federal politics. One particular source of ire for Kelly is the avalanche of outside money that’s flowed into federal politics since the Citizens United decision, where the Supreme Court ruled that corporations, nonprofits and labor unions can run independent spending to help or hurt candidates. President Donald Trump speaks at a Granite City Works warehouse on July 26, 2018. Trump easily won the 12th District in 2016, even as he lost badly in other parts of Illinois. The 12th District race is widely seen as a toss-up by groups that monitor congressional district races. And both candidates are throwing very sharp jabs. Bost is attacking Kelly for his record as state’s attorney, contending he's been too leinient against people accused of crimes. Kelly has strongly pushed back against that claim, and in turn has sharply criticized Bost for his votes on health care. In some respects, both candidates have sought to showcase their independence from the major parties. Bost, for instance, has sought to align himself with organized labor groups — adding that he opposes right-to-measures that would bar unions and employers from requiring workers to pay dues. Kelly has promised not to vote for House Minority Leader Nancy Pelosi to be speaker if Democrats capture the House this year. Both candidates generally support steel and aluminum tariffs that Trump implemented. But Kelly said he doesn’t like how those tariffs were placed on steel from allies like Canada. Bost also said that he is concerned about how retaliation from China is affecting the 12th District’s agriculture commodities. Trump won the 12th District by a fairly significant margin in 2016, which may be why Kelly isn’t taking the tack of derisively linking Bost to the president. Bost believes that if Trump continues to retain popularity in the 12th District, it will end up helping his re-election bid. But he doesn’t back everything Trump does. There’s a more local variable that may end up deciding the Bost-Kelly race: Green Party nominee Auxier who could siphon votes that likely would go to Kelly. Auxier is a philosophy professor at Southern Illinois University-Carbondale. 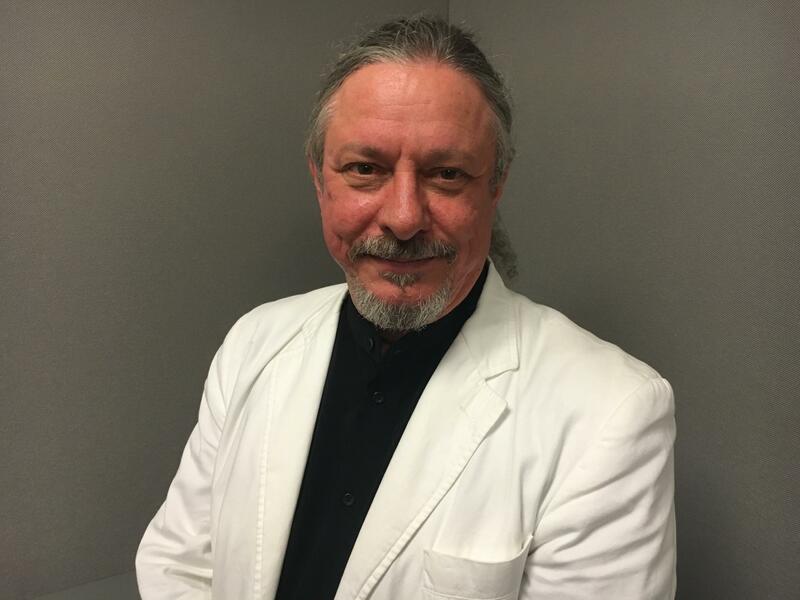 He’s been active with the Green Party since moving to Murphysboro in the early 2000s, most recently running for a seat on the Jackson County Board. Auxier’s platform includes an emphasis on environmental protections — and a push to eradicate corporate influence on federal politics. He’s opposed to tax cut legislation that passed earlier in Trump’s term, contending it will burden future generations with debt. Chicago-based billionaire J.B. Pritzker has already sunk $70 million of his own money into his gubernatorial campaign, and incumbent Illinois Gov. Bruce Rauner has spent $50 million himself. That spending will only increase as the Democratic and Republican party nominees, respectively, now look toward the general election later this year. But how much of the candidates’ resources will be directed downstate is yet to be seen, said Belleville News-Democrat reporter Joe Bustos. He joined St. Louis on the Air host Don Marsh for a discussion of this week’s primary election results.